StressMyPC allows you stress testing processor, graphics card and hard drive. Warning: Unstable and overclocked systems can be crashed. Small adjustments and cosmetic corrections. New Language for the PC-Stress-Test: Korean. 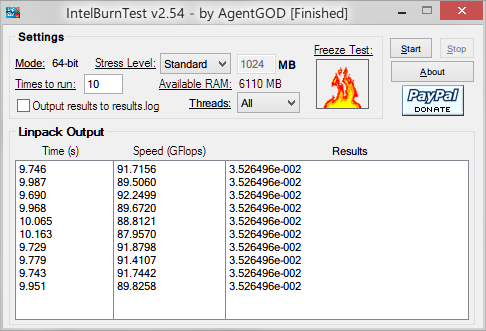 IntelBurnTest allows CPU benchmarking and stability tests under a heavy load. The program is commonly used by the overclocking community to measure CPU temperature when used in conjunction with a separate temperature monitoring program. 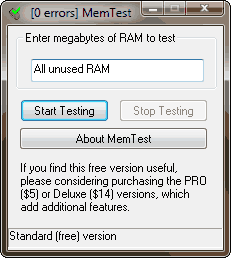 NOTE: The program will stress the CPU, memory, and north bridge, meaning the machine will run unusually hot. Make sure your PC is properly cooled and ventilated before use. Additionally, setting the "times to run" past 20 doesn't provide better results. The program is a front-end for the CPU stress testing utility Intel Linpack. How to extract: Download the ZIP package and extract to a folder of your choice. Launch IntelBurnTestV2.exe. DownTester tests your Internet download speed by connecting and downloading from multiple locations. It will sequentially test the download speed of URLs that you choose, going to the next after specified number of seconds has been elapsed or after it downloads the specified amount of KB according to your preferences. DownTester can also do a more limited test the download speed of your local network (for example: \\MyComp\myfile.zip). Because the program uses the number of bytes read from the file, instead of counting the number of bytes transferred over the network, this may not be an accurate speed test. A slow connection may be caused by computers on your network and not your network hardware. How to extract: Download the ZIP package and extract to a folder of your choice. Launch DownTester.exe.